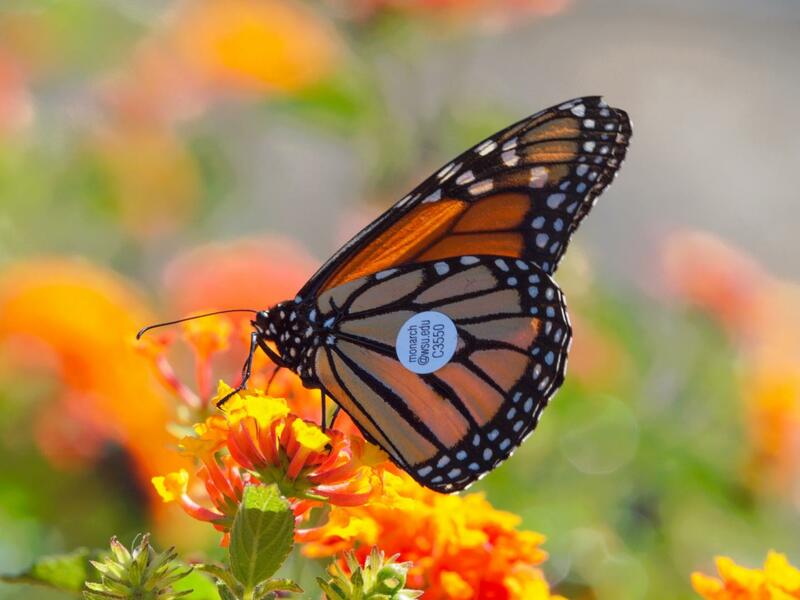 PULLMAN, Wash. – After five years and nearly 15,000 tagged butterflies, scientists now have proof that Monarch butterflies migrate from the Pacific Northwest to California in late summer and fall, a journey averaging nearly 500 miles. Most of the tagging was done by citizen scientists and inmates from the Washington State Penitentiary in Walla Walla. The prisoners are carefully trained in raising, tagging, and releasing Monarchs. The findings were recently published in the Journal of the Lepidopterists' Society. WSU entomology professor David James spearheaded the project, which took a massive amount of time and coordination to put together, ultimately involving hundreds of volunteers. The research was unfunded, making the volunteers indispensable. "On average, these butterflies averaged almost 40 miles of travel each day," James said. "That's pretty remarkable for such a small creature." Though scientists don't know exactly how the butterflies travel that far, they suspect the Monarchs may ride warm air currents called thermals a few thousand feet up in the air, then use the strong upper-air currents to navigate, James said. The paper covered the initial five years of the project, from 2012 to 2016. Participants tagged and released 13,778 Monarchs that were raised in captivity and tagged 875 wild Monarchs. More than one-third of the raised Monarchs were reared by inmates at Walla Walla, James said. Butterflies were released from around Washington, Oregon, Idaho and British Columbia. A total of 60 tagged Monarchs were recovered more than six miles from their release point, a return rate that James said was expected based on similar work done in the eastern United States. None of the recovered tags were from the wild Monarchs. The longest recorded journey was from a butterfly released by James himself in Yakima that was recovered at Tecolote Canyon, near Goleta, California, a straight-line distance of 845 miles. On average, the 60 recovered butterflies travelled just shy of 500 miles. The results from this project will be used to show migratory corridors where areas can be stocked with flowers, James said. Migration is a very vulnerable time for Monarchs. "They need fuel, which is nectar from flowers," James said. "If we have large areas without flowers, then they won't make it." Most scientists think the butterflies descend from their flight in the evening to feed, then eat again in the morning before finding thermals to ride back up, James said. Monarchs have seen a huge population decline over the last two decades, James said. It's estimated populations have declined approximately 90 percent over that timeframe. Ensuring nectar resources along migration routes will help them survive their journeys. James said he's never worked on a project with so many citizen scientists before, and is incredibly grateful for all of their help. "The results we got would have been impossible without their help, whether that's the prisoners or just people that care about butterflies who have contacted us," James said. The project is still ongoing, with nearly 5,000 people on the group's Facebook page. James thinks that eventually, technology will eliminate the need to tag so many thousands of butterflies. "Right now, microchips are too heavy for Monarchs," James said. "But the technology is improving so quickly that we're hoping to get something that will track an individual throughout his or her journey. Then we can just chip 100 or 200 butterflies and not tag 15,000."